You can’t deny gravity. Well, it’s extremely hard to anyways, and even if you are able to escape its grip, it isn’t at all sustainable for any real length of time and it's not long before you come crashing back to the reality that gravity is tethered to you for life. Well, here goes... There lives a magnificent artist and like all masters, his palate is an extension of himself. Spreading the colors of life across his palate he took up the one singular narrative of his masterpiece on one single grand canvas. Blank as it was, with each brush stroke life was brought to the canvas and the artists expressions lite up the imaginations of all who saw it. Starting with an apostolic background the essences of the colors mixed creating variant shades that would later interconnect the dynamic articulation and contexts he would soon add to tell his story. It has been some time since I was this hungry to see an upcoming film. For the last month I have been excitedly waiting for the movie 'Silence' to be released with more then an eager imagination to engage the story and dramatic scenes of cultural and religious reflection. With such an internal build up, it was ironic as we sat in the theatre following the show and I shared with my wife and friends that it was not at all what I had expected. I thought I'd begin this post with a bit of a story in my life.I grew up in the church. Probably not the one you’re expecting. While not overly religious, my parents baptized me as an infant in the Catholic community they were a part of back in Hamilton Ontario. It would only be a few years later that my parents would divorce and my mother and I would move from Fort McMurray down to Calgary. I grew up in a musical household. My mother would play guitar in the living room and I would sit with her singing worship songs and camp tunes for hours. She used to love taking the break in between worship songs to sing 'On Top of Spaghetti' with me; at least until I learned the alternative lyrics of 'On Top of the School House'! Some how whenever I broke into a different rift of words, the tune would sour and she'd stop playing. How important are the lyrics to the notes which are played along with them? Deeper still, must there be proper emotional response to the lyrics which go along with such notes? Bevans and Shroeder reminded me of that early lesson in life with their analogy that, "Like a complex fugue or polyphonic motet, God's unity is constituted by diversity and God's diversity is rooted in unity of will and purpose; the church is the church inasmuch as it has been included in that harmony." (Pg. #298) The lyrics of the church's ecclesiology must be in the harmony and unity of the message to which it embodies or it ceases to be the church entirely! Nor can we void the internal depth of emotion to which that message is to be embraced as a missional community itself! I'd be remised to say, like the small taste I had as a boy, I can't wait for that day to sit with my mother again and sing praises to God; and I promise, I'll get the lyrics right! We crowded into a dark lit theatre as we awaited the beginning to the telling of an age old story filled with adventure, action, violence, love, mystery, and yes, even the miraculous!! As the lights went down it was clear, no one around us could be recognized for their beliefs, no ones theology was visible to the neighbour beside them let alone written on their sleeves. We truly were Nicodemus's in exodus of reality to a world of a called people and the wrestling with a God called "I AM"!! I love these moments, the ones where we can retreat into our imaginations, seek out the deeper questions and meanings of these cultural stories, and see how they shape our lives and who we are! Yet, when the lights all come back on, it seems like the chains of dogmatic judgements, theological and denominational boundaries, all creep back in to enslave us back to the Christian Right to which we are supposedly apart of; as though our lack of imagination, our literal word for word expectations, and our inability to "read between the lines", some how sets us a part from the world as people of righteousness; as people who are superior to that of the "non-believer". What a people of enslaved grotesque spirituality we have become! Ridley Scott, in his film 'Exodus - Gods and Kings' has taken up the story of YHWH and his people once again. Yes, you heard right! It is not a story about Moses, Ramesses, or Pharaoh. It is a story about YHWH, the God named 'IAM', and the people he chose to call his own!! Hollywood got it right and it is the brilliance behind Scott's film. This paints an even deeper theme of wrestling that we find in the film. It wasn't just the Hebrew people who wrestled with God; it was the Egyptians too! Who was this YHWH who held authority over their gods? Who were these Hebrew people, those called people of "I AM"? Who are they as a nation called Egypt, neighbours to YHWH's called nation? It wasn't just Moses who sat on the shore of the Red Sea questioning God, "If I am not an Egyptian General, if not a deliverer, a messiah to the Hebrew people; who am I?" Ramesses too questioned his vocation and calling in the eyes of his creational identity. What are the issues a king is suppose to address - issues of glory, greatness, and inspiration or issues of legacy, death, and the altars of a tomb? From his own lips. "Am I a pharaoh who is to live as a Bedouin his hole life?" What contemplations that question may offer when you consider the coming 40 years Moses would spend roaming the dessert with the shadow of God in the midst of a Tabernacle moving from place to place!! In Exodus 6:7 God speaks to his people and says, "I will take you to be my people, and I will be your God, and you shall know that I am the Lord your God, who has brought you out from under the burdens of the Egyptians." What does it mean to truly know God? The word "to know" in Hebrew is "yada". Yet yada is to know in the most deepest way, the most intimate way, so that ones vocation, ones calling and characteristics, ones very identity is intertwined into that which they are in relationship of knowing. To yada God, to know "I AM", is to be eternally wrestling with the very fabric of what he is doing in shaping your character, your personhood, your life. God is saying, "I AM in your work place! ", "I AM in your home! ", "I AM in your thoughts! ", "I AM in your marriage's! ", "I AM in your friendships! ", "I AM in your churches! ", "I AM in your theatres! ", "I AM in your life!!" Yes, this is a film of a great many of people who wrestle with God and the ways in which they encounter him. It is a wrestling that still happens today as we are confronted in dimly lit theatres and the oppression of the Christian Right's cracking whip to resist wrestling with the one called "I AM" as apposed to the one called "I say". 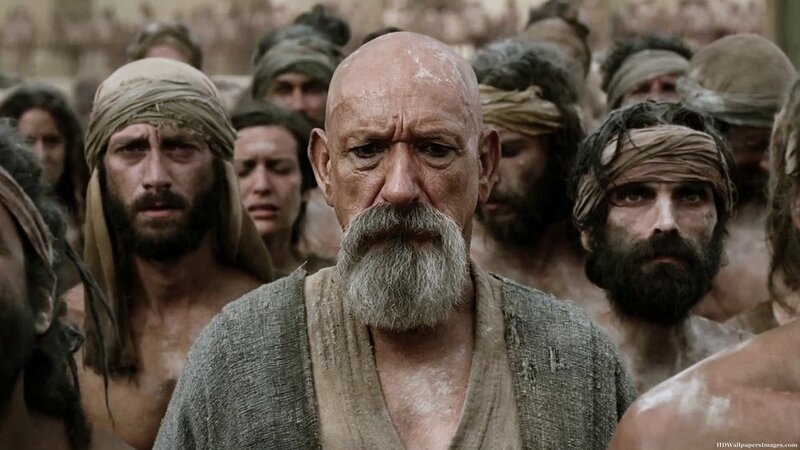 I'm sure, like me, there is much that you are wrestling with in Ridley Scott's latest telling of Exodus; some of which may be fair. Yet let us wrestle with this freely as people who God has given a promised land of imagination, freedom of expression, creative artistic talents, and a living heart for the one true God. And to those who would turn a face of condemning judgement over those who dare to see beyond the confines of earthly empires and institutional structures; I say to you... LET MY PEOPLE GO!! !